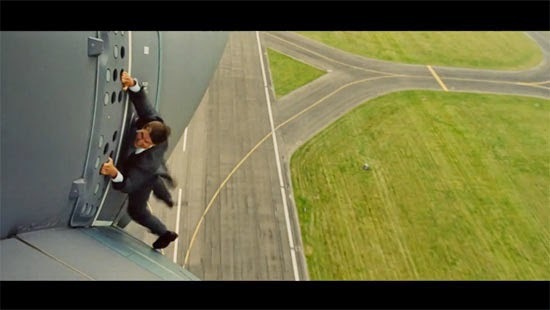 Another exciting instalment of 'Mission Impossible' is yet to be viewed in all cinemas worldwide this coming July 2015. A film series that had been watched by decades now is still giving people the excitement on how the lead actor will portray all the amazing stunt in the movie. The newest instalment entitles 'Mission: Impossible Rogue Nation' will feature Hollywood actor Tom Cruise who happen to lead the last Mission Impossible movie entitled “Ghost Protocol” year 2011. Tom Cruise will be portraying again the IMF agent 'Ethan Hunt' who will be accompanied by Veteran Hollywood actors namely Jeremy Renner, Rebecca Ferguson, Alec Baldwind, and Simon Pegg. According to the teaser that was released by Paramount Pictures on Youtube.com, Ethan and company is set to stop an international rogue organization called the 'Syndicate' who is trying to shutdown IMF. An exciting part of the teaser is you'll be seeing one of Ethan Hunt's (Tom Cruise) stunts, hanging on the side of a military plane which was said that the actor perform himself. This movie is scheduled to be released in IMAX theaters worldwide and in North America by Paramount Pictures on July 31, 2015. Comments or suggestions about "'Mission Impossible 2015' video trailer released" is important to us, you may share it by using the comment box below.